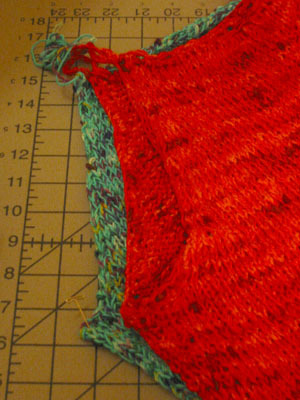 I didn't really have to count stitches (though I did)... a quick glance at the width of my tank compared to my mom's told me that they were very close. Medium it is! On not getting gauge: I'll admit, I didn't swatch for this tank, but -- here's the rub -- I'm pretty sure that I didn't swatch for my tank, either. Was my tank "wrong", too? Or did I make adjustments in needle size? When I laid the tanks out together, armhole-to-armhole (as above), I was extremely relieved to see that they were almost identical in length. My original suspicion was right: my gauge was pretty far off for my Waikiki tank, and it looks great. So if using no. 9 needles is wrong, I don't wanna be right. Other Comments (what I wished I'd known before I started this project): I didn't get gauge using the no. 9s, but I didn't get gauge on my tank either. Since my mom wants her tank to fit her just like mine does, wrong is right for this project! Also, these yarns tend to tangle -- check them frequently while knitting before it gets too tangled to use! I'm so glad that there won't be any ripping necessary. What a relief. All that pretty, pretty green. Hey, happy St. Patrick's Day!